Hi! I'm TigrissDoesGeckos! I love leopard geckos and own 5 right now! A normal female leopard gecko named Sky, a tangerine named Mango, a midnight blizzard named Echo, a murphy patternless named Luna and a Super Hypo Tangerine named YumYum. 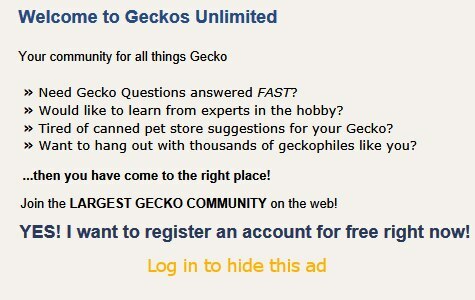 I'm also gonna breed geckos this year! 12:32 AM - Elizabeth Freer quoted TigrissDoesGeckos in post Underweight Gecko Feeding?? 05:38 AM - Elizabeth Freer quoted TigrissDoesGeckos in post Underweight Gecko Feeding?? 11:03 AM - TigrissDoesGeckos quoted Elizabeth Freer in post Underweight Gecko Feeding?? 10:32 AM - TigrissDoesGeckos quoted Elizabeth Freer in post Underweight Gecko Feeding?? 06:54 AM - Elizabeth Freer quoted TigrissDoesGeckos in post Underweight Gecko Feeding?? 07:38 PM - TigrissDoesGeckos quoted Elizabeth Freer in post Underweight Gecko Feeding?? 05:53 PM - Elizabeth Freer quoted TigrissDoesGeckos in post Underweight Gecko Feeding?? 04:28 PM - Elizabeth Freer quoted TigrissDoesGeckos in post t rex leopard gecko dust question ?? 04:15 PM - Elizabeth Freer quoted TigrissDoesGeckos in post HELP !! I think i pulled my leopards gecko eye!! 01:14 PM - Elizabeth Freer quoted TigrissDoesGeckos in post HELP! I dropped my baby leopard gecko! 02:01 PM - Hilde quoted TigrissDoesGeckos in post How do I post a forum?